Since you didn't go to the game, you missed out on history. 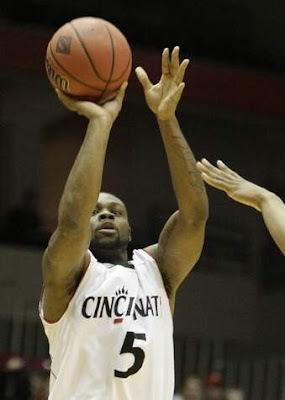 Deonta Vaughn powered UC in their first round NIT game with a win over Weber State. Vaughn got assist 505 to become the all time leader in assists. In the second half, Vaughn drilled a 3 to pass Darnell Burton and take the title of most 3 pointers made in a career. It was a special night for #5. Vaughn needs 26 pass to pass Danny Fortson for 3rd place all time in scoring. Congratulations to Deonta. Monday night, Cincinnati plays host to Dayton at 9 pm. Will Bearcats Blog be there? Maybe. It won't be hard to get a ticket apparently. Let's get on to the recap. The game started off slowly, as we only had 2 baskets made the first 4 minutes. They were 3s from Ibrahima Thomas, and Lance Stephenson. Damian Lillard hit a 3 for the first points for the Wildcats, followed by a Steve Panos lay up. Darnell Wilks hit another UC 3, answered by a Nick Hansen triple. The Wildcats took a 10-9 lead on a Trevor Morris lay up. Cincinnati took the lead after the under 12, as Dion Dixon hit a couple of free throws. The half started off incredibly sloppy. Lots of missed shots and turnovers. The free throws started a 7-0 UC run, with a Thomas dunk, and a Jaquan Parker steal, lay up, foul and free throw. The Wildcats went on a 9-4 advantage to cut the lead to 20-19. Morris hit a jumper, Ibby made a pair for free throws for UC, Lindsey Hughey scored a lay up, Thomas was stripped for a Morris layup, Stephenson hit a pair of free throws and Hughey drilled a 3. UC would respond with a monster run, thanks to their press the last 6:30. Lance hit another 3, Vaughn got a steal, passed to Cashmere Wright for a jam. Another turnover on the inbound pass led to Vaughn hitting Stephenson for a lay up and the assist record. On another turnover, Vaughn hit Cash for 3. Things slowed down for the next minute, until Cash picked Lillard and threw ahead to Wilks, who threw down a reverse pump jam. Weber State turned the ball over yet again into the under 4, leading to a Stephenson jumper. A minute later, a Gates steal turned into a Wilks miss, a Cash rebound and assist to Vaughn for 3. The 17-0 run ended on a Lillard 3. He made another trey to cut the lead to 12, but at the end of the half, Vaughn hit Larry Davis for 3. The 20-6 run gave UC a 40-25 halftime lead. Weber St had 15 turnovers. Steve Panos got the second half scoring started with a 15 footer. UC's first points came on Vaughn's record breaking 3. Weber St took a timeout after the make, allowing the crowd to acknowledge Vaughn's assist and 3 point record. Wilks showed off his athleticism in the next sequence. He blocked a shot from behind, and followed that by slamming down an alley oop from Lance, with a foul. Lillard and Gates traded lay ups, then Lillard and Vaughn traded 3s, and we went to the under 16 with UC up 50-32. The lead went to 20 on a pair of Vaughn free throws. Panos and Gates traded a layup and a wide open dunk respectively. Hughey drew a foul, and missed the first 2 free throws for Weber State of the game. They came at the 13 minute mark. Morris scored a basket with a foul, making the free throw to cut the lead to 17. Lance Stephenson made a lay up, and that kicked Weber State into a run. Mahoney made a layup, Lillard a scoop layup, Mahoney 2 free throws, Hughey a lay up, foul, free throw, and Bullinger was fouled, making 1 of 2. Cincinnati settled for jump shots, going 0 for 8, highlighted by an airballed Lance Stephenson 3, in which he was wide open. The 11-0 run ended when Vaughn found Jaquan Parker for 3. Hansen answered right back though. Cash scored a lay up at the 7 minute mark to push the lead to 10, but ended up hurting his hip. Weber kept the lead close. After Larry Davis made a pair of free throws, Lillard scored a lay up and 2 free throws to cut the lead to 8. UC would put the smack down to close things out though. Ibrahima Thomas hit a pair of free throws to push the lead to 10. Yancy Gates blocked Panos, who was falling away. Coach Rahe of the Wildcats thought it was a foul. He argued his case poorly and received a technical foul. Vaughn stepped up and made both. Gates got another block, leading to Larry Davis hitting a jumper to make it 69-55 at the under 4. Gates pushed the lead to 16 after he pulled down an offensive rebound, looked to pass out, but turned around and scored. Deonta Vaughn drilled a 4th triple, making the UC total 11, a season high. Lillard and Gates traded layups, before Hansen made a pair of free throws. Eddie Tyree and Alex Eppensteiner got some run the last minute. Eppensteiner got a trillion without touching the ball, but Tyree was stripped, leading to an alley oop to Tyree, who was fouled and made the free throw to end the scoring. Cincinnati shot 25-64 39%, 11-28 39%, 15-16 at the stripe, with 33 rebounds, 11 offensive. UC had a whooping 21 assists on the night, probably a season high. Deonta Vaughn had a great game with 16-5-7 assists-2 steals, Lance Stephenson 14, Ibrahima Thomas 9-5, Yancy Gates 8-6-3 steals-2 blocks, Larry Davis 7, Cashmere Wright 7-5 assists, Darnell Wilks 7, Jaquan Parker 6-5, and Dion Dixon 2-4. Weber State was 21-47 44.7%, 7-18, 13-17 at the line, with 30 rebounds, 4 offensive. They turned the ball over 22 times. Damian Lillard went for 26, Trevor Morris 9-4, Lindsey Hughey 8-6-4 assists, Steve Panos 6-4, Darin Mahoney 4, and Kyle Bullinger 1. Cincinnati was pretty energetic considering they had no one show up to watch them play. 2,200 was the attendance according to the Enquirer. The Cincinnati Enquirer, not the tabloid paper. It's all about winning, and that's something that the Bearcats did tonight. That's the good thing. Up next, it's the Dayton Flyers. Dayton hasn't won a game in Cincinnati since 1834. Let's see that streak continue. It's March people, get up for this. Quick NIT results: 2 Rhode Island 76 7 Northwestern 64, 1 Virginia Tech 81 8 Quinnipiac 61, 3 Dayton 63 6 Illinois St 42, 4 Kent State 75 5 Tulsa 74, 2 Mississippi 84 7 Troy 65, 3 Memphis 73 6 St John's 71, 6 Nevada 73 3 Wichita State 70, and 1 Illinois 76 8 Stony Brook 66. What happened to Yancy Gates?